One of the favorite food gifts to give during the holidays is homemade candy. True you can still give fudge and the usual Christmas candies but sometime being usual is also being boring. The person who gets the gift might smile and say "thanks," but the point is, it is still usual and to be blunt, damn boring. Our thought process this year was simple. Be outrageous and be damn delicious. So we took a favorite homemade Christmas candy and combined it with everyone's favorite food. The outcome? 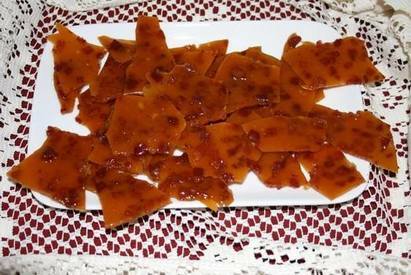 A downright addictive new candy treat we lovingly call Applewood Smoked Bacon Brittle. In every bite you get the wondrous taste of Applewood smoked Bacon combined with the rich sweetness of homemade brittle. Christmas cannot get any better!